The revolutionary four-leg design ensures the step is always touching the floor to reinforce stability and prevent tipping. A unique foot opening allows hands-free operation, enabling you to maintain eye contact and rapport with your patients when positioning the step…no bending over required. The step's corners and edges are smooth and rounded to guard against scrapes and cuts. And at exactly 8", it's the familiar height of steps just about everywhere. 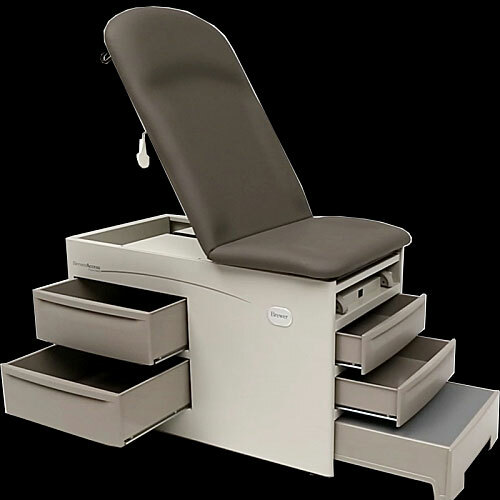 Offering four large, spacious drawers, the ACCESS™ Exam Table holds an abundance of supplies. Its exclusive patented pass-through back drawers can be accessed from either the right or the left side of the table, placing supplies close at hand wherever you are in the room. That's right…the back drawers pass right through the table, offering incredible storage capacity from one side of the table to the other. In addition, the drawers offer a precision glide system for smooth operation and are made of reinforced, smooth ABS for easy cleaning. Many offices go through multiple rolls of table paper throughout the busy day, so we've included room for three extra rolls right under the upholstered top. Versatility Exam room layouts vary in design. 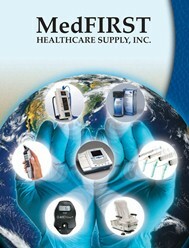 That's why we created the Brewer ACCESS™ Exam Table to be versatile and flexible. ACCESS™ easily adapts to any room layout. Its exclusive patented rear drawers are accessible from both the right and left side of the table, allowing ACCESS™ to fit any exam room configuration. Only want the drawers to open from one side of the table? No problem. Simply install the drawer stop we've provided and you can configure the rear drawers to open from only one side. Versatility isn't just about drawers. Electrical outlets need to be convenient and adaptable as well. ACCESS™ outlets can easily be switched from one side to another…all you need is a screwdriver and a few minutes of time. We've designed the Brewer ACCESS™ Exam Table with an emphasis on comfort and practicality. The upholstered top is made of multiple layers of resilient foam, contoured and curved to the body's natural shape. Seamless upholstery, void of stitching and embossing, provides a smooth surface for easy cleaning. The stirrups are contoured and more ergonomic to help relax patients during uncomfortable procedures. They offer three lateral positions and can be extended easily when the leg extension is deployed. A pneumatic cylinder lets you smoothly adjust the backrest with ease, whether you're positioning patients for exams or just changing the table paper. All these features…in one exam table. Table Length: 57.3", extends to 71"
Treatment Pan: 12.75" x 10.38" x 2.5"